The monster reared on its hind legs, thrashing at the air. Its hooves raised dust all around, and its voice was like the laughter of a mad god. “Is it angry?” Moraika asked, watching it in terrified awe. Its long face, slender legs and muscled flanks gave it a beauty sadly absent from the llamas she kept in the hills. Moraika spared the Spaniard only the briefest glance. His clothes were well shaped and boldly coloured, though stained with blood. On his own he would have been fascinated, even on this third visit, but he was nothing next to the horse. The creature reared again, trying to break free of the rope tethering it to a wooden stake. “What will happen to it?” she asked. Other villagers were gathering around with clubs and axes. They nodded in agreement, but none approached the beast. She strode over to the dead Spaniard and took the whip from his belt. She had seen him hit the beast with it last time he came to town, to claim his so-called taxes. That had seemed to quiet it. Imitating the Spaniard’s movements, she twitched the whip until it made a cracking sound against the packed dirt. Approaching the horse, she hit the ground by its feet, trying to intimidate it. The beast reared up, snorting, and lashed out at Moraika. One hoof hit her on the shoulder, knocking her to the ground. Clutching at the pain, she dropped the whip and rolled aside. Hooves hammered the ground where she had been. Trembling, she rose to her feet among the other villagers. Instead of coming to her rescue they had stepped back in fear. Now they tried not to look at her or at the beast. Moraika took a deep breath. The smell of blood filled her nostrils, coming off the dead body and the men who had killed him. No wonder the beast was lashing out. It must be terrified. Who did it know here except its dead master? And if he was anything to go by, with his whip, his sword and his taxes, what could it expect from men but cruelty? It was hard for Moraika to approach the beast again. An echo of pain still tingled all the way down her arm, and she had to fight a great urge to turn and run. But she forced herself forwards. Raising her hands she approached the horse. As she did so she sang one of the gentle, nonsense songs with which she soothed her llamas. The beast’s eyes were wide, foam flecking its mouth. The stake creaked as it pulled against it. At any moment it might break free and trample them all to death. Moraika’s mouth was dry, but she kept singing, hands held out towards the horse. It reared up again, legs thrashing. She closed her eyes and waited for the worst. With a noise like the crashing of thunder, the beast struck the ground in front of her. Trembling, Moraika kept up her song. Again the sound of thunder, dust billowing into her face. The beast was so close she could feel the heat of it. Hot breath brushed her skin, and a mad, sputtering sound filled her ears. She forced her eyes open. The creature was staring at her, nostrils flaring an inch from her hands. Slowly, still keeping up her song, she reached out and touched its face. The fur was short and coarse, yet felt sleek as she ran her fingers down it. The horse took a step forwards, and Moraika flinched. Its head brushed against hers, and then a tongue as rough tree bark rasped across her cheek. Moraika let out a sigh as she looked into the horse’s eyes. It was even more beautiful up close. Kneeling down, she unfastened the rope from the stake. As the townspeople watched in awe, she ran a soothing hand down the horse’s flank before leading it away towards the stream. She felt exhilarated. To stand beside such a creature was like meeting the emperor himself, like walking in the company of some divine messenger. The encounter between the Incas and Pizarro’s Spanish conquistadors is one of the most fascinating and messed up moments in history. A couple of hundred armed reprobates took control of the largest empire in South America, and one of the reasons for their success was their horses. The Incas had never met creatures like them, and many were terrified. This story is set some time after that initial encounter, when the emperor Manco Inca led a rising against the Spanish. It didn’t work out, but the rebels did take out some of the Spaniards – mostly those caught on their own while out visiting lands they had been given, as in this story. If you enjoyed this story then there’s plenty more where it came from. 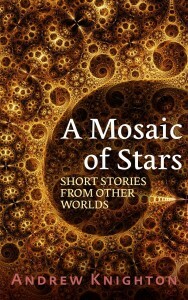 My latest collection of short stories, A Mosaic of Stars, is out now as a Kindle e-book. Collecting all the flash fiction I’ve published on this blog up to the end if 2015, it contains a wide range of brief stories. So if you’ve enjoyed those stories and would like to have them in a handy collection, or would just like to help support the blog, then please go grab a copy. It’s only 99c for the first week, and free today as a special Friday treat. If you’ve enjoyed reading these stories on the site, and you feel that you’ve read enough of them that you could review them as a set, then please take a moment to leave a review for the book on Amazon. Getting some early reviews would be really helpful. Oughtn’t it be “llamas”? Pronounced “yahmahs”? I’d like to pretend this was me using an archaic spelling for atmosphere – both lama and glama were once used – but that would be a lie, I just missed an obvious typo. Thanks for pointing it out!